Totally Absorbent is a distributor of absorbents and other related products established in 1991, serving Fire Companies, major waste and trucking companies and the automotive industry. In 1995, we expanded our services to include responses to oil and other hydrocarbon spills. Headquartered in Eastern PA, we specialize in all organic oil drys. Most of our oil drys do not contain crystalline silica which is a potential cause of cancer. Sorbital AP is environmentally friendly helping to minimize waste going to our diminishing landfills. Its native population of microorganisms assist in bioremediation and it can be recycled as an alternative fuel. When used on water it locks in the hydrocarbons protecting wildlife and reducing environmental impact. Service means a lot to us. From the smallest order to the largest oil spill, we can handle all of your needs. We guarantee quick delivery and in most cases same day delivery! Give us a call or E-Mail with any questions or concerns that you may have. We would love to talk to you. We hope you enjoy your visit to our Web Site. 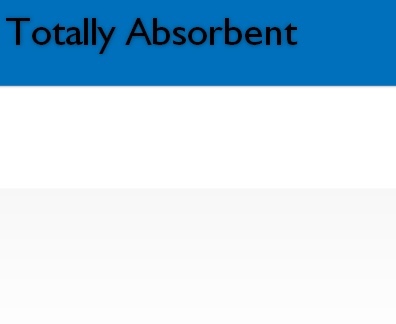 Thank you for visiting the Totally Absorbent Website! During the month of April, Ultra Utility Trays are on sale! Take a look at our specials page for the sale prices. Look for our “New Products” page or click below.